Got a crafting urge all bottled up? Even though you recycle the plastic you discard, you sometimes feel guilty about how much you throw out and worry about where it's going. Would you like to be a little more hands on and proactive and recycle some of your plastics yourself? If so, I've got some ideas for you. Do those used plastic gift cards always seem too pretty to just throw away? You can make guitar picks or jewelry from them. You can make beads out of plastic and make even more jewelry. 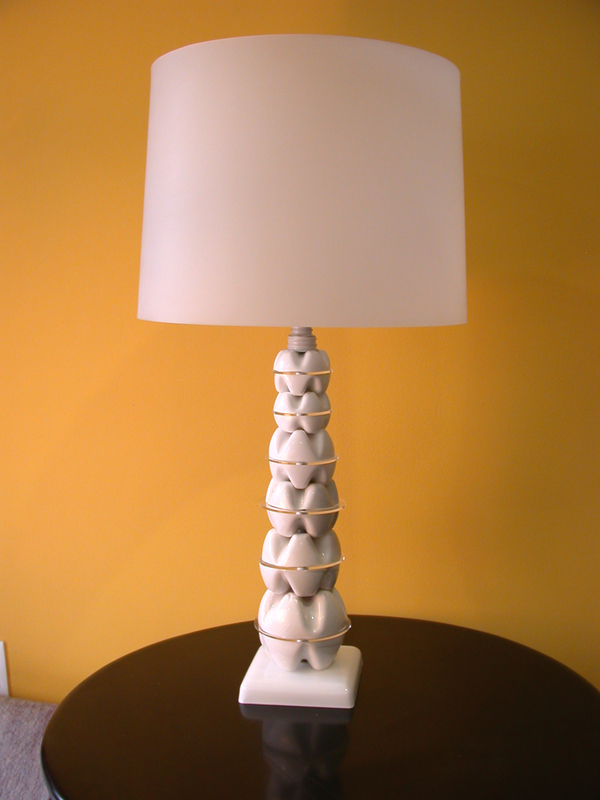 If you'd like to make some home furnishing and décor items, you can make lamps from milk jugs or water bottles. If you'd prefer a pendant light, that's an option too. If you've got the ceiling height and live near an ocean, you can make a “Tide Chandelier” like artist Stuart Haygarth, who made this chandelier from mostly plastic objects he found on the beach. If you've been ordering in a lot lately, you might make a chandelier like this one out of your plastic spoons. You could also make some interesting candlesticks and containers from plastic bottles, or a dish out of plastic bottles and aluminum cans. If you want extra green points, you could grow your own food in this self-watering plastic bottle planter. Or you could just make some plastic flowers that don't need watering at all. Your children might enjoy making butterflies or a bottle bank, making and racing “robottles”, or some of the plastic bottle top games and crafts listed on ehow. If you like to fish perhaps you could use a minnow bottle. More ideas for recycling plastic containers can be found here, and you can also check out this list of 12 practical ways to recycle plastic lids. If you're more of an artist than a crafter, you could take your cue from Heath Nash's plastic bottle designs or sculptures, or Aurora Robson's gallery of plastic bottle sculptures, or Kosuke Tsumura's “Bottle Armor” or “Bustle Style” works. And whatever recycled plastic craft or art project you undertake, rest assured that you're not at all likely to run out of supplies. My grandmother makes these. Durable as hell. Since I've already done a plastic bag post, I confined this one to hard plastic recycling crafts. Awesome. Guitar picks and terrariums were my favorites. Also, I have this somewhat paranoid idea that the plastic recycling at my university might be simply thrown out by evil facilities people. I have no evidence for this, but I'm thinking of putting a GPS tracker in a plastic bottle that I recycle to find out where it really goes. I have this somewhat paranoid idea that the plastic recycling at my university might be simply thrown out by evil facilities people. I worked at a grocery store in high school, and the assistant manager had us just toss away all the plastic bags from the public recycle bin to the trash dumpster. When I objected, he said that they changed contractors but then eventually canceled pickup altogether. I suspect this sort of thing goes on all over. Also, I may just have too much yuppie in my blood, but I find recycled plastic art/fixtures hideous and hope that biodegradable plastics make it to the market sooner than later. you sometimes feel guilty about how much you throw out and worry about where it's going. Except that the average household can only stand so much tacky plastic craft cruft, and you aren't putting much of a dent in the waste problem by making a few guitar picks out of a plastic Starbucks card, especially when you consider that everything you make, all the jewelry and lamp shades and self-watering planters and grocery-bag rugs and so on, is still going to end up in the dump eventually. All non-biodegradable plastic products need to be illegal unless the manufacturer can provide a very good reason why the thing should be built to last forever. Then you can make biodegradable jewelry. This is cool, a fused bag shopping tote. SmilePlastics recycles plastic bottles into interesting things. Recycled potato chip bags, mat. ok, scrap metal but my favorite, a radio. fun too: croc. rose. I got through the first post and thought "hey, someone's ripping off Orange Swan's schti...oh wait, never mind. Another awesome post. Your crafty links are always inspiring. It isn't that you've got too much yuppie, it's more that you don't have enough old lady in you yet. Orange Swan... please stop giving me ways to use stuff that I'm trying to forget I have. I already feel guilty for having spent too much credit on frivolous consumer goods. Now you tell me that not only do I have to recycle my useless purchases into meaningful personal items but also that I have to find a way to meaningfully discard my plastic credit cards? Do you sometimes feel guilty about how much you throw out and worry about where it's going? Here's a handy tip: stop consuming so much crap. Better quality unwatermarked first link picture. Invert the top and force the bottle top into the bottle until the cut edges line up. If it isn't a tight fit you can tape the edges. A friend of mine uses #6 to make shrinky dinks. They're super duper cute. Years ago when I was in art school we had a shrinky dink art show. Well, yeah. But I can't write an FPP that just says "stop buying so much stuff". My idea is that people start thinking of ways to use what they already have to make something they need, they will consequently buy less. Good idea, salvor hardin. Municipal "recycling" is the biggest scam in history. Back in the 1970s the trash haulers of the world (see "Tony Soprano") realized that by painting a few of their garbage trucks green, and applying some muscle to municipal governments (already in their back pockets), they could double the number of trips thy needed to make up and down your street, and double the number of trips they had to make transporting waste to out-of-sight locations, and (of course). Why do you think the press release that your city government sends out every year boasting about how much "recycling" they've done, only gives you a numerical breakdown of what material they've collected, not what has happened to those "recyclables" after they've been collected? The hard fact is, there is virtually no real market for your old newspapers, bottles, and other crap. The only exception is aluminum cans, which are worth something, and which are quickly gathered up by the homeless, who turn them into cash. Believe me, if there were any market at all for your wine bottles or soggy old newspapers, you wouldn't need organized crime families to collect recyclables in trucks, and you wouldn't need to separate out your crap into little piles, because the homeless or other independent entrepreneurs would be out on your tree lawn going through your trash themselves. Organized crime has had about 30 years (since the first Earth Day, I'd estimate) to perfect the recycling scam and integrate it into their overall lock on the trash hauling trade. Why not demand that your city government start to measure the success of recycling in terms of the amount of trash that is actually -- I mean truly -- purchased by a profit-making entity and turned into other products for which there is some market demand? I'm really interested to know who's buying up all the wet piles of newspapers that my local trash haulers have to make two, and sometimes three trips a week up my street to collect. I'd be thrilled to learn the ratio of carbon burned by huge, inefficient garbage trucks driving all over town hauling recyclables to non-existent customers, to the environmental benefits of all that recycling. Do, indeed, put a GPS tracker in your recyclables. But don't blame me if you get whacked. Oh wait, this isn't about buying things, right? I'm always a little irked at how freely the term "recycle" is misused. Recycling really means putting materials back into a system or "cycle" of use, whereas making art objects or other new things out of old stuff is actually just a salvage process. I was the chief engineer, installer, and technical guy for a large scale mosaic project at the museum where I work, and the head artist/educator, a small staff, and a crew of kids from drug treatment and juvenile justice programs, as well as local shelters, built a panelized curved wall mosaic of more than 170 3x5 foot panels comprised of mirror, old bottles, stained glass, broken pottery, tile, and ceramics in a mortar matrix. It's often described as "recycled," to my irritation, even though the process of building the piece specifically removes these materials from circulation. Our mirror (60% of the overall surface), was cut-off scrap and breakage donated to us by a local mirror and glass company, as were all of our bottles (mostly cobalt blue glass) and a substantial percentage of our stained glass, which was breakage from a stained glass wholesaler in New Jersey. If these materials were recycled, they would be returned to the stream, broken up as cullet, and made into new glass. In the final form of our mosaic, they are, in fact, at the end of their cycle. It would not be cost effective to break up the panels for reuse, and so these materials are where they will stay until they are eventually discarded. If we're lucky, and the museum's funding survives the current round of economic disaster, the mosaic wall may last for many decades as a beautiful art object (IMHO), but it's certainly not recycling. When we use our materials, we end their potential for recycling. I think that's okay, though. Language is a big problem in all this, as well as the current fads in sanctimony. You hear "green, green, green" from people who rip out the "non-green" interiors of "non-green" homes and send them to the dump in order to put in obscenely expensive and supposedly "green" non-outgassing, off-the-grid, holier-than-thou crap that you read about in apartment therapy and all the other sites and magazines where rich white people indulge their green hobby out of a misplaced puritan notion of personal redemption. Maybe it's just me, but I'd rather hear "salvage" when I hear about people making great things out of stuff they'd otherwise just chuck out, but it doesn't carry that mythopoeic weight of being metaphysically sanctified by a role in some great cycle of reuse. "Salvage" sounds uncool, unhip—a working class affliction. What we should really be doing, and what I've been working on at the museum since the mosaic project wound down at the end of the grant that funded it, is finding ways to replace newly-manufactured materials in things we're going to need or want or build anyway. When I came on board in my current position, one of my responsibilities was to be head groundskeeper for the facility, and I've been dealing with a serious drainage problem in our sculpture garden by building a series of low walls to raise the beds and direct water flow better. Rather than build with new materials, though, I'm building walls in a system that uses old soda cans laid like bricks in a matrix of mortar (taking lessons from my mosaic experience and the work and experimentation by the earthship people). It's a simple build, and uses much, much less cement than conventional construction (lighter walls need lighter footers), and when it's smoothed and stuccoed, it's damn pretty, too, in forms that are curvaceous and interesting. In my case, I mosaic over the final result, so it becomes an art object in its own right, even if I do say so myself. I'm not creating a craft to use up materials, which would just leave me with slightly prettier crap to replace the crap I'd otherwise be throwing away—I'm salvaging a free material to save myself the expense of buying and transporting freshly-manufactured building materials. I also save energy, raw materials, and waste in a more global sense, but that's the icing on the cake, and why I love salvage so much. For almost any need, there's usually mountains of materials waiting to be used, and there's enough existing need out there without having to create demand with handicrafts appropos of nothing. All you need to do is be flexible about the end results you're looking to achieve, in contrast to some fifty years of pre-determined notions of what is and isn't good enough. I'm lucky, though, and I know it. I've got an unusual and rich source of raw materials coming my way, every time we break down a show. I do my job, and dumpster dive in our parking lot in the evenings. So far, I've got almost every single stick of wood for the new outhouse I'm building to replace my collapsing (and full) old one, and I've got fancy UV-blocking thick plexi windows made from an old display case and a bench for the toilet seat made out of a plinth for a huge Alex Grey sacred mirror, and the rest from bits and pieces out of the construction dumpsters across the street, and come spring, I'll be sitting pretty (with cosmic rays shooting out of my backside, probably). It's not recycling, to be sure, but I'm filling a need without needing to tap supplies of new raw materials (or spend money), which is just as good. This all shouldn't be about buying the stuff other people make from old stuff—it should be about reconnecting to the inherent, essential craftsman in all of us, finding ways to avoid spending money, wasting good stuff, and otherwise being nothing more than a consumer in the ugliest sense of the word. the sure way to destroy the pick guard of a nice acoustic guitar is to use a broken credit card as a pick. Aren't gift cards made from a different sort of plastic? They seem much more pliable to me. Gift cards may be more flexible, orange swan. I suppose my point is to not experiment with novel materials for guitar picks. Carry around a whole pocketful of conventional, store-brought picks, so that if you're at a gig, and you're last pick breaks, you don't have to improvise. Faze - Elizabeth Royte's Garbage Land has a good look at what happens to garbage and recyclables, including the impact of all those extra truck trips. I found your comment very interesting, sonascope, so much so that I keep re-reading it, but I think you have a too-narrow definition of recycling. So, yes, according to meaning #2, using an object to make something new like a mosaic or a toy is properly called recycling as well as salvaging. I think the proper criteria is whether the object is still in use/circulation rather than whether it will be fit for a further adaptation when it reaches the end of its usefulness in its reincarnated state. I do completely agree with your comments about how people are more often willing to "recycle" than "salvage", and how they haven't really thought through the environmental consequences of their supposedly greener choices. As I said in this comment, we need to redefine terms like "garbage" and "rags" and break down the sense of entitlement that keeps us from making more responsible choices. Faze writes "Organized crime has had about 30 years (since the first Earth Day, I'd estimate) to perfect the recycling scam and integrate it into their overall lock on the trash hauling trade." Not all garbage hauling and recycling programs are run by organised crime (or even contracted out). Here the program is run by the city. 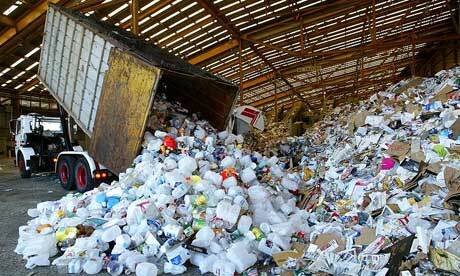 Much of the reason for the curbside recycling push is to divert waste streams from land fills. Even if municipalities have to pay to get rid of, for example, newspaper it can easily be a net win over creating new landfill space. Even though not as lucrative as aluminum (90+% return is hard to beat) many curbside recyclables are for sure worth diverting. Corrugated cardboard for example can run as high as $150 a tonne. And there are secondary benefits like not cutting trees for newsprint. dog food sugar, Your comment had me off on a lovely ramble through Poopscape. omg ShrinkyDinks, had forgotten alll about them. I love that they shrink in the oven. Fun doll's furniture but such a great design. I love the idea that these chairs would be easy to take apart, store and then reuse, like say, in a tiny apartment. sonascope, You're really smart. But a party pooper. I have always imagined that in some not-too-distant "Road Warrior" future, commercial enterprises will mine old landfills for the hidden long-chain hydrocarbon materials buried there. What we consider waste today and what the thoughtful among us desperately try to make use of will some day be considered a raw material to be converted to fuel and newer polymers with as yet undiscovered uses. Even if municipalities have to pay to get rid of, for example, newspaper it can easily be a net win over creating new landfill space. Where do they put it? A few years ago, it was discovered that my county was piling up old newspapers in an enormous shed with a hand-painted sign on it that said "Recycling Center." The papers just piled up and piled up, and no one really had any plans to do anything with them. I think once this was exposed (by the daily newspaper, interestingly), the stuff was all hauled to a landfill and that was the end of it. In any case, Americans have been dutifully "recycling" for 30 years. You'd think if there was any market for used plastic Pepsi bottles or newsprint, it would have emerged by now. Newspapers are used as feed stock for new newsprint. Also about 75% of cellulose insulation is post consumer newsprint and other paper. PET is valuable which is why the tired fellow up top has it stacked as high as he can reach on his trike. Pepsi bottles are a PET plastic which is recycled to make everything from clothing (can be used in place of polyester, some polar fleece is 50% recycled PET for example) to new PET bottles. Pepsi bottles being clear are the most valuable type of post consumer PET. For example more than a billion pounds of recycled PET stock was sold in the US alone in 2006. More than a billion tonnes of recycled PET is forecast for Europe next year. 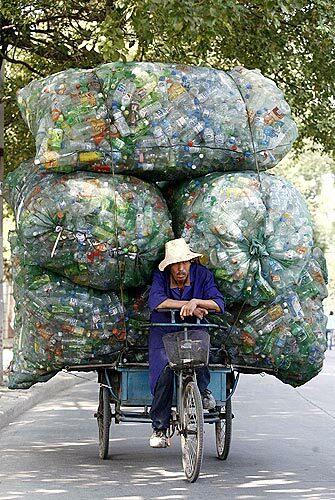 I have no doubt half assed example of recycling programs exist, after all we are dealing with governments much of the time. However anecdotal data points like this are not indicative of the effectiveness of well run programs or even global trends. My idea is that people start thinking of ways to use what they already have to make something they need, they will consequently buy less. Meh, from where I sit, this kind of thing just makes people who's energy and resources footprint is about 20 or 30 times the world average feel all warm and fuzzy about themselves because they're "saving the planet". The world environmental crisis will not be helped even one bit by a bunch of semi-idle first worlders making crappy decorations out of bottle caps. The world environmental crisis will not be helped even one bit by a bunch of semi-idle first worlders making crappy decorations out of bottle caps. If crappy bottle cap decorations were all that came of this than no, it would not help. What I'm aiming for here is a general shift in consciousness and perception that will lead to more holistic changes in people's lifestyles. I don't imagine that my little posts have some huge level of influence, but I hope that they will have some. And I think you're underestimating the difference small changes can make in the aggregate.